2) Use your pedigree charts or your family tree genealogy software program to find the person with that number in your ancestral name list (some people call it an “ahnentafel” – your software will create this – use the “Ahnentafel List” option, or similar). Who is that person, and what are his/her vital information? I arbitrarily picked my mother’s grandfather, George Alex Lineberry, who was born in 1844. Dividing that by 100 gave me 18.44; I chose to round up rather than down because I have already written several times about my number 18 ahnentafel grandparent, Nancy Foster Buckner Watson Saling. Number 19 on the chart would be Mellie Jane Welch Willis’ (my maternal grandmother) grandfather, M. Robert Welch. We don’t know a great deal about him. Even when I thought Robert and Sarah Welch were my great-grandfather’s parents, I wasn’t at all confident. What information we have has been very hard-fought for. We believe he was born November 7, 1828 in South Carolina to Elisha ‘Eli’ and Jane Blakeney Welch and died October 13, 1861 in Fayette County, Alabama. He married the former Sarah A. Farquhar in about 1851. Robert and Sarah had four children: Basheba Jane Welch (1853), James Alexander Welch (ca. 1854), Mary Isabella Welch (1858) and William Thomas Welch (1860). Our research on Robert Welch is still very incomplete. When my daughter, Kay and I had the opportunity to travel to Fayette County, Alabama in 2010, we searched for probate documentation to see if we could find anything on Robert Welch that might confirm or deny him as the father of William Thomas. We did find administration files that identified his widow as Sarah A. Welch and listed each child’s full name, including William Thomas, plus the fact Robert died before 1862. Over the past two years, I have assembled a fairly convincing amount of supportive documentation for the identification of Robert as William Thomas’ father, including, the fact the administrator of his estate was James Farquhar, who I eventually discovered was the father of his widow. In June 1858, Robert purchased 80 acres of land in Fayette County and in July 1860 he purchased another 40 acres of land (since the plot below shows 160 acres, he also purchased an additional 40 acres). 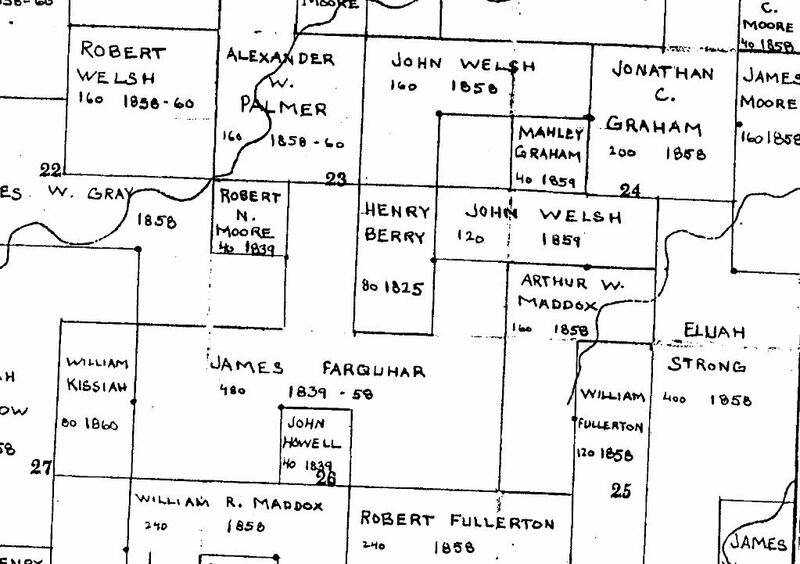 A land map of the time period in Fayette County reveals the proximity of his land to his in-law’s land (James Farquhar a little below and to the right). A few months ago I received an email from someone in the Farquhar family who told me the family tradition says the person buried in the Mount Pleasant Baptist Church Cemetery across from the family homestead listed as M. R. Welch was the deceased spouse of their daughter, Sarah. Since the birth death dates listed above were taken from that headstone and they fit the information we have discovered about Robert, I believe the tradition likely to be accurate. Although we have managed to compile a framework of basic information about Robert, including what we can learn from the 1850 and 1860 census records, land purchase records, the administration papers for his estate and the presumed location of his burial, we know very little about him, his parents or his siblings. I would, as always, welcome input from any Welch, Blakeney or Farquhar/McGuire descendant who can shed more light on this man who died in his prime.